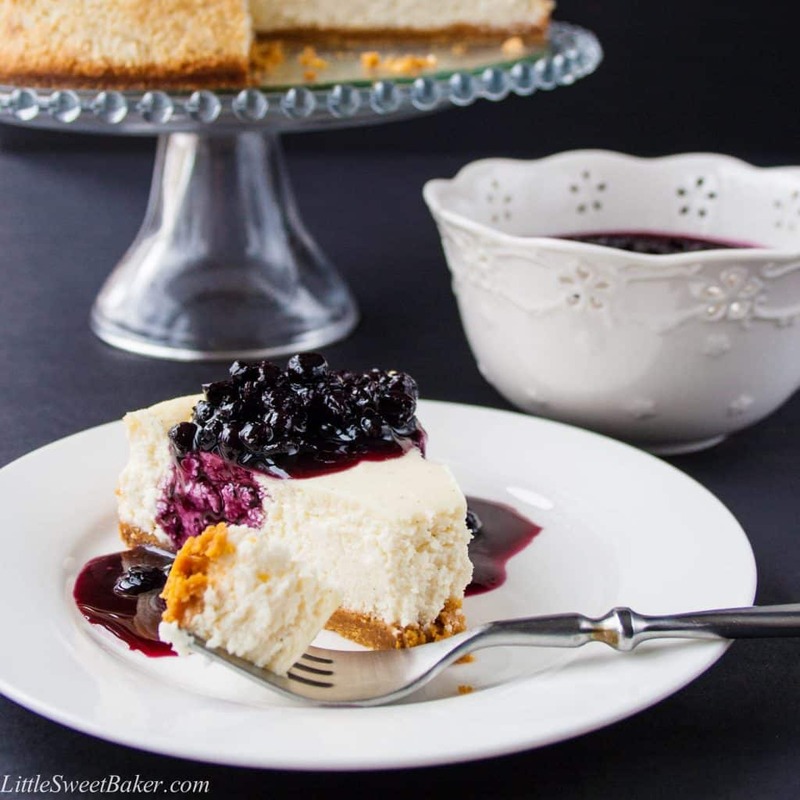 This is a creamy, delicious, vanilla bean cheesecake topped with a sweet blueberry sauce. 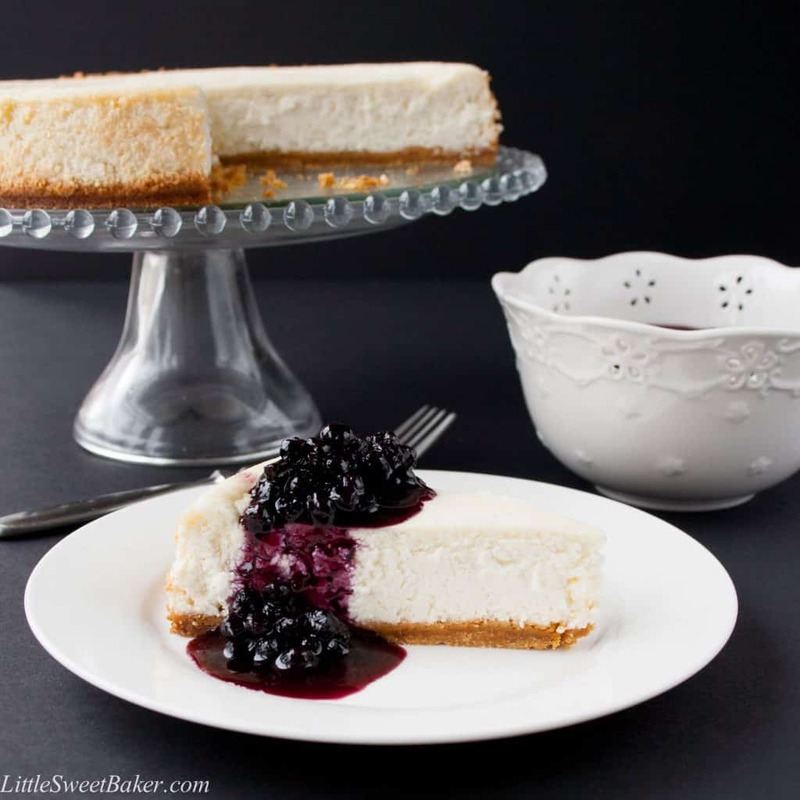 It has only about half the calories of a traditional cheesecake, but all the great taste! Welcome to the first post on my new site. I hope you guys like the new look. I wanted my blog to be more unique, more fun and most importantly, more user-friendly for my readers. Hence, I decided to take my blog to the next level with a full custom web design. Please note, it might take a little while for me to learn to navigate my new dashboard, so pardon any discrepancies in the layout of the new blog for the next couple of weeks as I fine-tune everything. Anyways, back to what you came here for: the cheesecake. 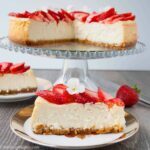 I created this recipe using low-fat cream cheese and low-fat sour cream, which has about 40% less fat than the regular version. I also only used egg whites in this recipe because they are fat-free. The result is a cheesecake with all the wonderful flavor and texture, but only half the fat, whoo-hoo! The appearance of this cheesecake is a lovely ivory white colour with fine speckles of vanilla bean seeds. The texture is velvety and smooth. The taste is creamy and not too sweet, with a natural vanilla aroma. 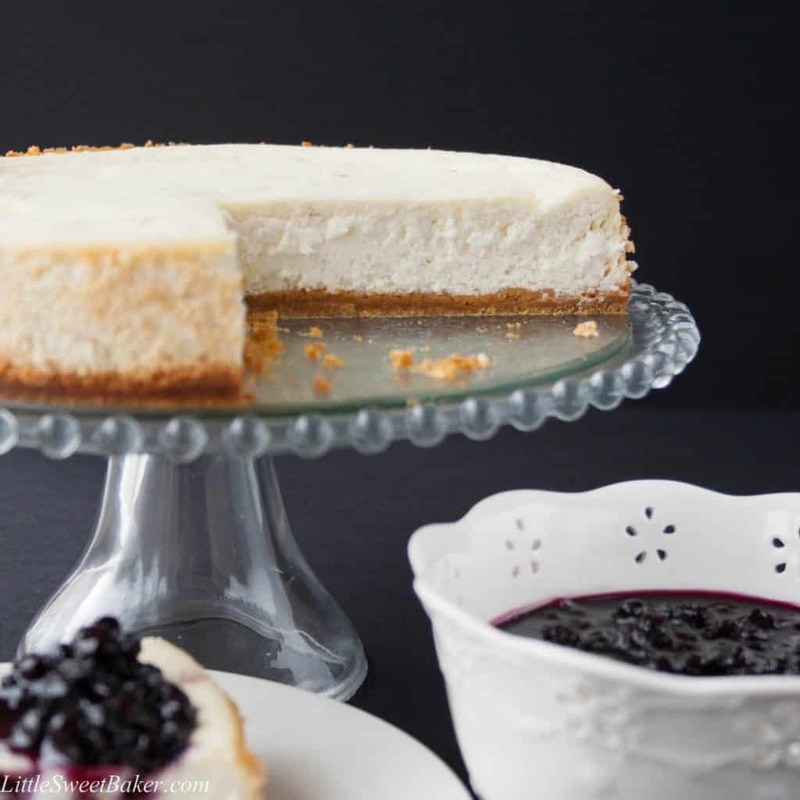 The simple blueberry sauce adds a sweet fruity flavour to the tangy cheesecake. This dessert is melt-in-your-mouth good and you won’t believe it’s low-fat. So, enjoy all of the pleasures of a delicious cheesecake with none of the guilt. Mix the cracker crumbs with the melted butter and press onto the bottom of a 9″ springform pan. Using an electric mixer, blend the cream cheese and sugar together. Add the egg whites, mix again. Then add the sour cream and vanilla bean seeds, blend until smooth. Pour over crust and bake for 50-55 minutes or until edges are dull and 2-3 inches of the centre is still looks wet. Run a thin knife along the edges and let cool completely at room temperature. Then refrigerate for a minimum of 4 hours or overnight. In a medium sauce pan over medium heat, simmer the frozen blueberries with the 1/4 cup of water until completely thawed. Stir in the sugar until dissolved. Mix the corn starch with the 1 tbsp of water and slowly add to the cooked blueberries. Reduce heat to low and stir until sauce starts to thicken. Remove from heat, let cool and chill in the refrigerator. Remove the rim of the baking pan, slice and top with blueberry sauce before serving. I love your recipes as they are simple enough to motivate me to try them and the photos are gorgeous enough to inspire me into action haha! I tried your choc chips muffins recipe for the first time yesterday and it was a success! Am inspired to try this decadent cake now but was wondering if u can share the ingredients’ exact measurements in grams for amateur bakers like me. Thanks so much! 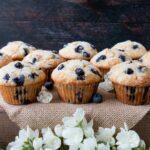 Sorry for the late reply, but I have updated the recipe with gram measurements for you. I hope you enjoy it and have a great weekend! Woot! Thanks so much!!! Much appreciated and can’t wait 2 try this recipe out! 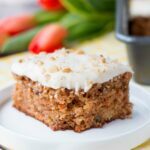 I baked this recipe earlier with my husband and we had a lot of fun making it together. The end result was delicious and we both give you 5 stars! Such a perfect and dreamy looking cheesecake.. and the blueberry compote is a delicious and spring-y touch too! Omg this looks incredible,love your blueberry idea. I love your cheesecake, Lily! Looks so delicious! Low fat?! I’ll take an extra slice then! 😀 This looks amazing! I have made a (full-fat!) vanilla bean cheesecake for my husband’s birthday for the past several years. I may have to sneak your version in this year!! 🙂 It looks wonderful- love your photos too! I am so out of the loop! Didn’t realize you’ve moved to self-hosted. Congratulations, Lily! The site looks great! 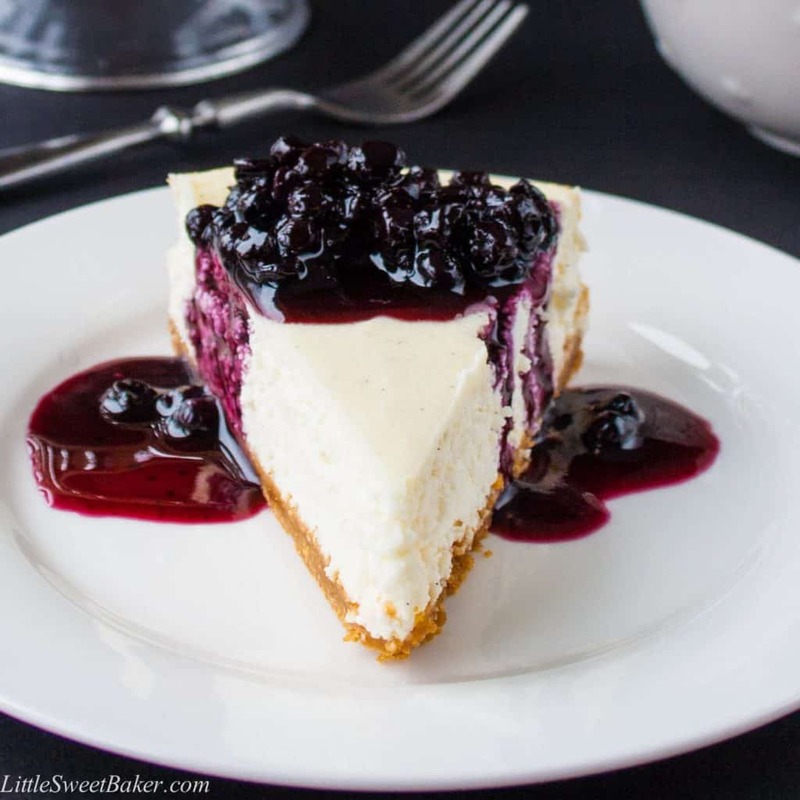 And how lucky am I to see this blueberry cheesecake recipe. I just bought 6 lbs of cream cheese! You heard right, 6 lbs! Low-fat never looked so good, Lily! Such a gorgeous cheesecake… The tops of mine never look that perfect. The blueberry compote sounds like the perfect topping. 😛 Thanks for sharing this “must make” recipe with all of us at Fiesta Friday! Wow! This looks heavenly, Lily. How can you make such beautiful cake?? 😀 I am taking two slices, okay? Wow, Lily! Another great looking dessert. I especially like the one photo where the slice is staring right at me, with blueberry compote drizzling down the sides. Have a great weekend.